Britain is making headway in satellite innovation. While the U.S. and Russia often steal the scene when it comes to wondrous space missions, in Europe the U.K is launching a new satellite that is sure to surprise its international partners. 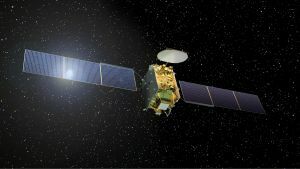 The Eutelsat Quantum satellite, built by the firm Airbus, will be the first commercial satellite equipped to shapeshift while in orbit. Operators will be able to reconfigure the satellite in real time, modifying elements such as its frequency and the areas of the earth it covers. The satellite, set to launch in 2019, will have a 15-year lifespan — with an additional three years taken into consideration for building — and will use its ability to reconfigure to keep up with changing market conditions and differing regulatory parameters. Instead of satellite makers having to predict the market or have their satellites become obsolete fast, the Eutelsat Quantum satellite boasts an extreme flexibility that will keep it ahead of the game. To give one example of how a hyper-flexible satellite like this might be beneficial, take the marine industry. To track a terminal’s journey across an ocean, you would typically have to use multiple beams from various satellites to cover all of the different regions across the water. Using this tech, a single beam from this one satellite would do the job. Additionally, traditional satellites are often custom produced, which makes them unique but less adaptable. This satellite, however, would be built following a reproducible standard, which means it could be mass produced. While this may give pause to those concerned about space pollution, it would definitely improve access to satellite technology. It’s unclear yet whether or not such flexibility will become mainstream in the future, but the new model’s capabilities are promising. What is sure is that the U.K. is making headway in this ambitious niche of the space industry.